Rating: 4* of fiveThe Publisher Says: Moments after his conviction for a murder he did not commit, at a trial presided over by a judge determined to find him guilty, Benjamin Weaver is accosted by a stranger who cunningly slips a lockpick and a file into his hands. In an instant he understands two things: Someone had gone to a great deal of trouble to see him condemned to hang--and another equally mysterious agent is determined to see him free. So begins A Spectacle of Corruption, which heralds the return of Benjamin Weaver, the hero of A Conspiracy of Paper. After a daring escape from eighteenth-century London's most notorious prison, Weaver must face another challenge: how to prove himself innocent of a crime when the corrupt courts have already shown they want only to see him hang. To discover the truth and clear his name, he will have to understand the motivations behind a secret scheme to extort a priest, uncover double-dealings in the unrest among London's dockworkers, and expose the conspiracy that links the plot against him to the looming national election--an election with the potential to spark a revolution and topple the monarchy.Unable to show his face in public, Weaver pursues his inquiry in the guise of a wealthy merchant who seeks to involve himself in the political scene. But he soon finds that the world of polite society and politics is filled with schemers and plotters, men who pursue riches and power--and those who seek to return the son of the deposed king to the throne. Desperately navigating a labyrinth of politicians, crime lords, assassins, and spies, Weaver learns that, in an election year, little is what it seems and the truth comes at a staggeringly high cost. Once again, acclaimed author David Liss combines historical erudition with mystery, complex characterization, and a captivating sense of humor. A Spectacle of Corruption offers insight into our own world of political scheming, and it firmly establishes David Liss as one of the best writers of intellectual suspense at work today.My Review: Last time we saw the Lion of Judah, aka Benjamin Weaver (né Lienzo), he had brought a species of justice to some victims of the South Sea Bubble. Now he's standing in the dock, convicted of a murder he didn't commit and facing the death penalty. Well, there's nothing like making the stakes obvious from the get-go: Fail to solve the crime you've been convicted of and die; solve the crime and bring the political system of your homeland to its knees. Drama for *days*!And well-done drama, if a bit crowded. Inevitably, setting stakes this high means that some smaller areas of interest (eg, the "romance") don't come to satisfying fruition. But there is more than enough good stuff here to make the less successful moments less important than the overall tale's pleasures. It's very satisfying to see a man of honor operating in that cesspit of dishonor that has always been, and seems as if it will always be, political action.What I enjoy most about Liss's historical fiction is that it is obvious to me that he roots the action in fact while still making a cracking good yarn. He sees history as "his story," as the college-freshman joke went. And that's how I got interested in history, and it's why I find satisfaction in reading David Liss's books. This work is licensed under a Creative Commons Attribution-NonCommercial-ShareAlike 3.0 Unported License. A gripping and most engrossing sequel to the tales of Benjamin Weaver, Portuguese Jew-come-thief taker in 18th century England. This one sheds light on the political processes and undercurrents of the time, which may not be what you had in mind when thinking of Britain as the birthplace of modern democracy, though many things may strike you as quite similar to what we are experiencing in the Western world today. Great characters and well-paced plot make this novel even better than its predecessor. Moved right on to the third installment. David Liss is just good at informing while telling a story. This is the third book I've read of his and each time I put his books down I think to myself, "Now that was a good book." And then, about 3 days later, I think to myself, "I actually learned stuffs from that read." In this case, I learned that elections have always had an ocean of hidden agendas simmering underneath them. I am currently vacillating between the horrifics and the comforts behind that realization.SPOILERS AHOY AHOYFurthermore, I learned there were two and a half political parties in England in the 17th century. You know when you were sitting in your American Government class, there was that 2 week span where the terms 'Tory' and 'Whig' were thrown around. I finally get what they mean, like in the context of people living in that time. So, besides all this knowledge stuff, the mystery that unfolds is interesting. The main character, Benjamin Weaver, is solid in his role as the dashing and intelligent sleuth. The villains are sufficiently evil, but in a human way...they mostly think their way is the best way as well. My one iffy point is I don't buy Ms. Dogmill's choices. She tells Weaver there is no chance of a relationship. She tells Weaver she is accepting of her brother's faults and stands by him. She risks sexual assault to canvass for her brother's political effigy to ensure he gets his way. Then she decides to be a major cog in Weaver's plan to take her brother down? Quite good, though perhaps not as good as the previous one in the series. The 'Jewish' angle is a lot less pronounced, which I guess is fine, but it was something I was interested in in the first book. The account of the 1722 election is fascinating and, I am supposing, well researched. I was only bothered by three places where the author used highly anachronistic language. In general, Liss does not reproduce 18th century English full-on, but he does a good job of giving a flavor of it. But he has one character ask another about the underlying "political ideology" of the Whig party. The terms "ideology" did not arise until the very end of the 18th century, in France, and then it had a somewhat different meaning from its contemporary one. Elsewhere, talking of labor combinations, someone describes them as having "communist" ideas. I'm pretty sure that term didn't arise until the beginning of the 19th century. And finally, someone describes a difference of opinion as merely "semantic." That word, I believe, was not coined until the end of the 19th century. For some reason, these terms disturbed me and made me a little wary, though of course they need not indicate anything serious in the actual content of the work. A Spectacle of Corruption is a story of the chaos that follows an election in 18th century England - and right smack in the middle of it is Benjamin Weaver, an ex-pugilist private investigator, who got pulled in in the mess by being accused of murder. Liss’s world and character building in this novel is simply captivating. The author’s use of language is just beautiful, helping put the reader quite at home in the setting. The election in question is filled with intrigues, political and social, between the Whigs and the Tories with the Jacobites’ plotting mixed in to bring back the deposed monarchy of Charles II. Liss created a grim and turbulent London in this novel wherein Weaver, an apt name, weaved his way to find who framed him and avenge his innocence. Weaver’s search is not easy. He finds the extent of corruption and mean plotting in both warring parties in full display in and out of their campaigning. Everything he sees and discovers is what the title suggests - a spectacle - and like anyone who sees it, Weaver is a spectator caught in the drama, literally and figuratively. Liss gives a convincing world in this story. It was fascinating to learn about elections in Weaver’s time and one would easily see that in the hundreds of years that have passed very little has changed in how elections are conducted. Like in his other novel, The Coffee Trader, Liss closed the story with a touch of sadness. Weaver will emerge not wholly triumphant in his mission. He clears his name, but loses something equally important to him in return. A Spectacle of Corruption is a rare wonder of a book that educates, entertains, and tugs the heartstrings. Set in 1722 London against the backdrop of the first general election since the crowning of George I, this is the second installment of the story of Benjamin Weaver, Jewish ex-pugilist private investigator. David Liss is a master of characterization, creating complicated, compelling protagonists, and Weaver is no exception with his appealing combination of daring, determination, dry humor, and (mostly) controlled violence. Weaver’s history allows him to move within many levels of London’s society, but he fully belongs to none of them, and this loneliness underscores the story and the series. In this book, Weaver is accused and convicted of murder, and must uncover the true events of the crime in order to exonerate himself. As Weaver navigates the chaos and corruption surrounding the political process the reader is educated as well, and David Liss’s deft wording alludes to similarities with the present without ever disrupting the flow of the narrative or taking the reader out of the world he has created. A Spectacle of Corruption had me on the edge of my seat and laughing out loud, and I highly recommend it! This was an exciting, fun read. An interesting look into what it might have been like in London in the 18th century. Employing the classic genre move of having the detective hero solve the crime in order to exonerate himself, we get a crash course in English politics and law of the time. Liss does a good job of capturing the language and the style of the times (or at least appearing to--I am not an expert in 18th century England and so I am sure he doesn't get it all correct. But it has the feel of something authentic).The ending was a bit too quick and things got tidied up too conveneniently, but otherwise the plot was well done--it was not predicatable or obvious. The characters were intriguing and fun. Quite apart from the Olympic Games, which I have been watching on television, I seem to be finding myself in London a good deal this summer. A few days ago I finished---and wrote about--Wolf Hall, by Hilary Mantel, a historical novel set in 17th century London. 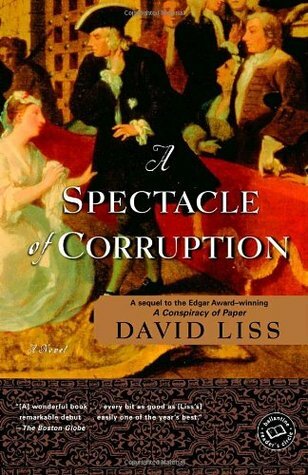 Just yesterday, I finished A Spectacle of Corruption, by David Liss, a fine romp through the back alleys and drawing rooms of 18th century London, in the reign of George I. And no sooner done with that, I happened to pick up from my pile of books The Professor and the Madman: A Tale of Murder, Insanity, and the Making of the Oxford English Dictionary by Simon Winchester--and immediately found myself in the darkest corner of 19th century, Victorian London. More of this last one later, when I've had the chance to read it. Meantime, I thoroughly enjoyed the adventure offered by David Liss. I had previously read A Conspiracy of Paper, in which the same hero, Benjamin Weaver, finds himself embroiled in murder and mayhem in the context of the infamous bursting of the South Sea Bubble. Weaver is the ultimate outsider--a prize-fighter, a Jew, a commoner, and a man of conscience and a rough sense of justice--in a society not unlike our own, riddled with greed, ambition, social climbing, and ruthless unconcern for the rest of humanity. He's tough, not unwilling to bend the law when dealing with people willing to exploit it, yet possessed of an essentially generous heart and tender sensibility. A fine character, filled, like most of us, with contradictions.This Spectacle of Corruption finds our hero narrowly escaping the hangman's noose for a murder he did not commit, breaking out of jail, and masquerading as a "gentleman" in his pursuit of justice in the face of rampant skullduggery on all sides. It's election time: the Whigs are battling the Tories. Behind the scenes, the Jacobites are skulking in hopes of restoring the Pretender, the would-be King James III, to the throne, and ousting the German usurper, George. There are few niceties in the election process. With the possible exception of murder, street riots, extortion, and the purchase of votes, there is something eerily familiar about the way in which these politicians use their lies and false promises to trade on the ignorance and self-interest of voters. Some things, it seems, change little over the centuries. Liss handles all this with great zest and humor. The first person narrative, in what passes convincingly for 18th century speech, moves along with all engrossing haste and takes us on a series of often hair-raising adventures. But, as with "Wolf Hall", it is the detail that engages: the somewhat tawdry splendor of the ballrooms and the drawing rooms of the rich, the squalor of the foul-smelling, rat-infested dwellings of the less fortunate, the stink of beer and gin in rowdy taverns, the back streets and alleys whose mud is generously mixed with human waste--these are the settings through which Weaver moves in his pitiless pursuit of the evil-doers who would gladly see him hanged. Woe betide those who cross him, though. This unbowed, irrepressible member of "the Jewish nation"--so universally scorned in my home country at that time--proves one of the few incorruptible in A Spectacle of Corruption. If you haven't yet encountered him, I can promise you a pleasure in making his acquaintance. A decent book that makes a better early draft than final version. In this book, Liss never found the balance between plot-forwarding action and the little details that give color to the main character's life even if they aren't strictly necessary. The book was too much a long series of actions strung together rather than a nicely flowing narrative. Even with this focus on the plot, the mystery takes so many twists and turns that the reader begins to forget what the problem was in the first place. Combine that with one of those endings that is a summation of individual characters' futures, and you get a pretty bare-bones story, and I wanted something to sink my teeth into. A Spectacle of Corruption is a historical fiction set around the time of the 1722 General Election; it is a mystery novel built on the backdrop of Whigs and Tories jockeying for position, on Jonathan Wild, on Jacobites and the royal succession. This background is a really exciting place for David Liss to construct his story of Benjamin Weaver, the Jewish, former boxer, private invesigator. Liss takes the trappings of the typical hard-boiled noir story, the flashback structures, the outsider narrator, and puts it within an intriguing historical construct. It does not break any new ground, but it is an entertaining and engaging read throughout. Everyone should read this book this year - election year. If you think our political process is corrupt, read this book and find out how bad it could be. The title is taken from one of the politicians running for Parliament in the book who says that the political process in 1722 London is "a spectacle of corruption." Like all of Liss' books, it is a fabulous portrayal of historical events wrapped up in a great mystery. The continuing story of Benjamin Weaver, a thief-taker. This is a story of his condemnation for murder and his determination to clear his name. The story of his love for Marion and her refusal to be with him. The plot is great, but the history of political process in the early 18th century is outstanding.This is a wonderful read! This is what great historical fiction should be like, rich with details, well developed characters and great integration of the historical background with the plot. It is a pleasure to read David Liss's books. I hope there will be more than three books in the Benjamin Weaver series because I can't get enough. Follow-up to A Conspiracy of Paper (a.k.a. The South Sea Company), the title of this book refers to the election – as (very interestingly given the seeming missing angle from the previous book) this book is based entirely around the 1722 General Election – the first Hanoverian election and fiercely contested between the Tories and the Whigs, with in the background the Jacobites plotting another revolution.In many ways the plot is similar to the previous book: again there are two opposing sides who both seem to fear and use Weaver for their own purposes and at different times seem either to oppose him or seek to destroy him; again Weaver’s main modus operandi is to break into the houses of key figures at night and torture or intimidate them; again Weaver has to understand a new and emerging area of UK society; again one of his key rivals is himself a vicious criminal although one that (partly due to not being Jewish) has a much better reputation than the much more principled Weaver. I picked up this book at a second hand book sale not realizing it was 2nd in a series until I got on to Goodreads to add it to my book list. It reads very well as a stand alone. Fast-paced, lots of twists and turns. Provides an interesting insight in to British elections in the 18th century. Will re-read for sure and am now interested to hunt out the other books about Benjamin Weaver. I loved David Liss' first book (and first in this series), A Conspiracy of Paper. LOVED! However, I'm going to have to go back someday and reread it, so I can discover why this second book didn't match my expectations. Still good and I enveloped myself in the historical world he created, but I had set my hopes up very high. Very GoodThe second Benjamin Weaver book sees the thief taker guilty of murder. But Benjamin will not go quietly to the gallows. This was another good book which I enjoyed. There were plots and twists against a backdrop of election corruption at a time of instability in the realm. A very good period piece. Новые приключения Бена Уивера - еврея, бывшего бойца и настоящего ловца воров, искателя приключений.Детектив - повод для автора рассказать о предвыборной гонке между вигами и тори в начале 18 века.Коррупция, злодейства и жестокость.Неплохо. At times I was uncertain as to the underlying crime and/or conspiracy, but I found the premise interesting as well as the time period. I may not have really gotten the whole Jacobite, Whig, Torrie issue, but the story flowed nicely and Benjamin Weaver is an interesting character. Another complex yet fast-paced historical thriller by author Liss, who has full command of the time and place and the motives of his characters. Difficult reading but very interesting. Elections were corrupt! I loved this book. Specifically, the author's characters' dialog and descriptive writing. The Benjamin Weaver series is always a fun ride back into history, spiced up with a bit of mystery. My husband and I really like David Liss' writing style and characterization. We have read several of his other historical novels and recommend his work to history buffs. Page turner based in 1720s London. A Spectacle of Corruption is a sequel, but you don't have to read the first book to enjoy this one. I read the first book years earlier and only remembered the basic biographical info relating to Benjamin Weaver. The book is filled with murder, deception, and characters who are not what they seem. It keeps you guessing until the final pages as to how Weaver can extricate himself. What I liked:The main character – nothing changed here. We deal here with a very likeable rouge but if you take into account the times he lived in and his underprivileged position within the English society you might judge him even less harshly. Of course Benjamin is hardly a saint - it makes him as well-rounded a character as I like. Despite tough conditions he always complies with his own set of rules although he is not forced to do it by anyone or anything, apart from his own conscience. Indeed, when you come to think about it he is fairer and more honest than most of high-born politicians-gentlemen who shamelessly sell their votes and political views to the highest bidder. In this part I found Ben really well fleshed-out and from time to time very amusing, still too infatuated with Miriam to behave rationally even if it would be in his best interest. Love is blind but I do hope he will get cured soon. The political background. Once again the period was researched thoroughly and explained in a very entertaining but accurate manner (as far as I know of course). At the beginning of the book we get even a short time line and key political terms included so you don’t have to feel like an idiot and you don’t need to be a history geek to get a grasp of the whole situation very quickly. The author never condescends to his readers and I truly appreciate his approach.Two female characters, Miriam Melbury and Grace Dogmill, featured in this book, were really exceptional although, I must say, not exactly as likeable as the main lead. Both being intelligent, capable and ambitious women, they did their best to find a better postion in a society dominated by men and get away with it. Miriam married an allegedly respectable politician and changed her denomination, practically reinventing herself as an English lady; Grace could be called a political animal - she took an active part in canvassing on behalf of a Whig candidate, supported by her brother, and tried to lead an independent life, even daring to chose her own lovers and not wanting to marry anyone, a very bold move for any woman at that time. Their strategies, although different, had advantages and disadvantages and I loved the fact these were fully exposed during the narration. However I found both ladies terribly selfish that's why my sympathy for them was limited. Still I am glad we met.Finally the baddies (I promise, I will be short now): I simply adore baddies who are as close as possible to real life people - complex characters, with many layers (like onions or Shrek who wasn’t a complete baddie but still, you get my drift) and an interesting personality. You can find such villains in this book - Jonathan Wild and Dennis Dogmill are just two examples. Thank you Mr. Liss for them, it was a treat.What I didn’t like:We are left with a whodunit mystery cliffhanger at the very end and, reading an interview with the author, I found out it was a deliberate move. I do not like cliffhangers although I do understand their uses when it comes to making people buy the next part of a series. Still not fair.Final verdict:A great sequel to the brilliant first part and a great historical fiction you can get addicted to. Yes, I’ve ordered the next book. I know, bad Anachronist. One more thing - this book can be easily read as a stand-alone novel so those of you who like jumping right in the middle of things won't have any difficulties at all (wink at Melissa). I am certainly not an expert on 18th century England. It is not even a period I normally enjoy reading about, because whenever I think about it, my poor imagination presents me with images of hungry, sickly people shivering in dark hovels while well-fed aristocrats drink wine and make merry in well-lit parlors. But after reading A Spectacle of Corruption I now have a whole new set of images with which to remember the time period.Images of games people played....."A plump goose was tied by its foot from a high branch of a tree, its neck well greased. Each participant had to ride at top speed under the goose and grab it by its neck. :Images of people....."She was short as a child, shapeless like an egg, and her ruddy cheeks and poor balance suggested to me that she was a bit overly fond of her drink. "And images of holding cells....."I could hear the nearby clicking of rat claws on the stone floor and the scrape in my ear of the lice....."I appreciated the author's attention to the details of 18th century London. It brought to life this historical period more than any other book I have read about it. But what I most enjoyed was the dialogue. It felt authentic. Here are a few examples...."There are no terms but that I shall get my sister and then I shall rip your head from your neck. ""Melbury be damned. That tightpurse wouldn't pay for a good riot if the election depended on it, which it does. "David Liss does a bangup job of transporting the reader to the streets of 18th century London. It's a fun ride. The story follows the main character, Ben Weaver, a Jewish thieftaker (and pugilist), who is forced to assume several disguises as he meets and mingles with many characters from different classes of society on his mission to prove his innocence for a murder he did not commit. (You might need a to take notes like I did to keep track of everyone.) It not a thriller, but there are several, well-placed moments of high drama when it feels like the jig is up for our hero. In the end; however, the truth is discovered, and payback is meted out in an interesting and surprising way. For me the takeaways are the fact that this story is set in a historical period for which I have no interest. (Although I enjoyed the story.) And I found the book too long at over 350 pages. But if these are not issues for you, then please add a full star on to my rating. My only other takeaway (and it is a minor one) is that some actions taken by the main character felt "out of the time period", that is not actions which I would expect a person from that period to take. I get this feeling with a lot of historical novels. It may be a case of too much of the modern author bleeding through. Or it may be a case of my own prejudices about what I think is right. Either way it is certainly not any reason to avoid reading this great book.I enjoyed A Spectacle of Corruption. I don't think I would read it again, unless it was for a term paper on 18th century London, mainly because of its length. But I would definitely..... most definitely read this author again. For this reason I give this story a 3.5 rounded up to 4.0. I loved the Benjamin Weaver books when I read them some years ago, but missed this one, which is a shame because it is a delight. Mr. Liss brings us into the world of British politics, with intriguing parallels to today. Well written and tightly paced, I had trouble putting this book down. When Benjamin Weaver went to a pub, he never expected to end up fighting for his life, let alone be arrested for the crime of killing a man he only met when the man saved his life during the struggle. But that's what taking jobs from mild-mannered preachers will get you. The minister had been threatened with violence if he didn't stop sermonizing against the Whig abuse of the poor, and asked Weaver -- detective, bounty hunter, thieftaker, shakedown man -- to find out who was responsible for the threats. But during an election season, even a homily for the poor can be part of an elaborate plot. And so, after effecting an escape from prison and a death sentence, Weaver must find out who is trying to frame him, and why -- and in the process, will find himself knee deep in a conspiracy to restore James II to the crown. A Spectacle of Corruption thrusts Weaver into the exciting and dangerous world of 17th century politics, taking readers on a journey through the dark, winding paths of London, into working class pubs and the galleries of the wealthy.Spectacle is a worthy successor to A Conspiracy of Paper, dominated by Weaver and a few other outstanding characters -- his doctor and friend, whose obsession with bloodletting (a running joke) has switched to enemas, Johnathan Wild, the 'thieftaker general' who is involved in every criminal plot of note, and (of course) a beautiful woman who is far more canny than proper society will allow for. Weaver has no idea who would be trying to frame him , and even less idea as to who wants to help out him. Someone placed a sobbing lass with a lockpick in his path before he was incarcerated. The man who Weaver immediately suspects, Wild, has nothing to do with it. The mystery is part of the battle being waged between the Whigs (corrupt businessmen), the Tories (corrupt aristocrats), and to a lesser extent between the Tories and the shadowy Jacobin plot to one day displace George I and restore to the English throne a monarch who can actually speak English. Unlike Conspiracy of Paper and Ethical Assassin, Liss doesn't use Spectacle to muse on any philosophical issue, except perhaps the frauds people perpetuate to find a better place for themselves within society, masking their true selves as not to cause alarm. I very much look forward to the third book in this series, The Devil's Company. David Liss - I am a novelist living in San Antonio, Texas, though, for the record, I am not from Texas. I just live here. I have four novels published: A Conspiracy of Paper (which won the Edgar Award for Best First Novel) and A Spectacle of Corruption were both national bestsellers. They are set in 18th century London and feature Benjamin Weaver, a Jewish former pugilist, thief-taker for hire. Weaver will be back in 2009 with The Devil’s Company, but he’s featured in a new short story, The Double Dealer” in the anthology Thriller , edited by James Patterson. The Coffee Trader is set in 17th century Amsterdam. It was also a national bestseller, and is a book group favorite. My most recent novel, The Ethical Assassin , is a contemporary animal rights thriller about door-to-door encyclopedia salesmen. My next novel, tentatively called The Whiskey Rebels, will be out in September, 2008. It's set in New York, Philadelphia and Western Pennsylvania during the early 1790s. For more information, or perhaps for different information, you can visit my web page at Davidliss. Otherwise, if you are interested in my books, or just want to talk about books in general, please add me as a friend.